We girls love to Run! and how! and everywhere! 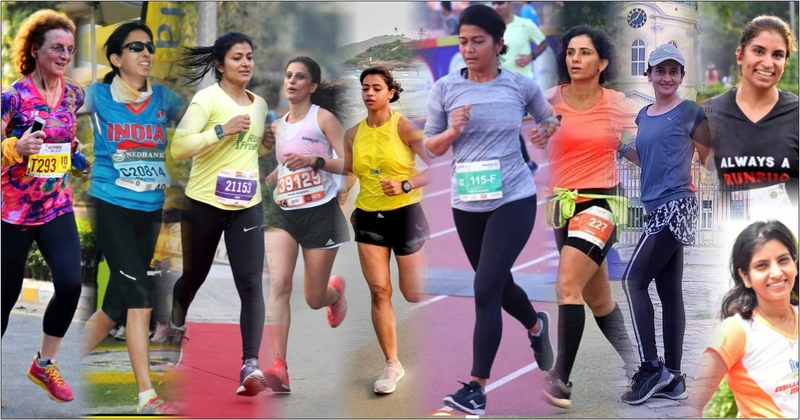 Running is a beautiful, zen, solo sport – but not always and not for the solo running ladies for sure (not even for men anymore) – so while most of us would love to get out on trails, pine forests, non -traffic routes etc etc. by ourselves – We do know that it comes with HUGE risks! I spoke with 9 women, who do get out often on their solo run sojourns and not succumb to fear – they control what they can -with intelligence, confidence and caution. The way that I deal with situations when running alone, I run on familiar routes – no experiments and be very aware of my surroundings. I keep myself aware of what is going on around me and always go with intuition or gut feeling. I run against traffic so I see vehicles approaching me. Being a woman running in the wee hours of the morning in a city like Gurgaon , isn’t exactly safe . In order to ‘ feel’ safer I do a number of things. However, the one thing I strictly follow is NEVER to run alone in the dark . I always try to ensure that there is another runner around me. While I know it’s not always possible to run together , knowing that you have support in case of an emergency definitely helps ! I also keep my mobile phone with me always when I go to run outdoors, so that I can make that call in case it’s needed . All the usual caveats – be aware of your surroundings, try not to run alone (though I often ignore my own advice), but I think the biggest piece of advice is to PUSH BACK. Challenge anyone who hassles you, take his photo, circulate it (I did, every time some lowlife groped me), shout, scream, make a noise. Stare them right in the eye as you do so. Let them know that you’re not afraid. I always kick these men in the balls, or on the shins, or sometimes, just thump them on the head. I have twisted the ears of boys who were rude to me, slapped men who touched me. Just this morning, a group of teenage boys did the staring and giggling and staring some more routine as they passed me, so I stared right back, turned round to see they were all still gawping at me, so I yelled at them & whipped my phone out. They scarpered. Buggers. When I started running 4 years back, the major inhibition I had was running alone at the wee hours on road!That’s y running in the park across the house was my best alternate and thus running long seemed a difficult task..Faced many unpleasant experiences even around the colony I live in!So, with time and with knowing the insane lot of runners around, the best way out I found was getting hold of my male runners friends for the long runs starting at 5 in the morning. There was no better way to run free mind on those dark delhi streets and also it made the family back home tension free. Find a running buddy ( I confess, I don’t always can get one )-Second and what I feel most important to me personally is to carry a mobile phone always, without fail with speed dial and emergency button on top of screen.It somehow gives me sense of security and I feel confident that in case emergency arises I would be able to alert my family and friends and may possibly scare away the intruder . If I am alone I do try to go to a geographically known, well lit area like Nehru park and Embassy area around it . However my go to Safety tip is my mobile phone always fully charged, before my long runs, unlocked and ready with emergency button on top which could be activated with just one touch. For road safety, you need to be visible and wearing bright gear. In the dark, reflecting gear is a must. You can stitch the reflecting tape to your top, or wear a band on head/ wrist or ankle. Visibility is a must to avoid accidents with vehicles. If you must run Alone in the early hours or late nights, you must carry a phone, ID tag with emergency contacts. Carry your own water. Or money to buy some. -The most important thing I have learnt in over 10 years of running alone in the streets and trails is that one should never LOOK vulnerable. Look brave (even if you don’t feel so at times) and run with confidence. Look any potential harasser in the eye and let him/her know you are not scared and they better not mess with you. -It’s also very important to be aware of your surroundings .Running alone ,on the streets, with headphones on is a complete no no from me. You can’t avoid a problem if you are not even in a position to see or hear the signals. – It is also best not to explore new trails and roads running alone. Run those ones alone only after you have run on them with friends/in a group and know that it’s a safe route to run alone. -Though I do not run with a phone, it is probably a sensible thing to have your phone on you on your solo /longer runs. – Knowing the basic self defense moves and carrying a pepper spray and likes is always a great idea.It will ensure you try and ward off the harasser instead of simply panicking! Run in group and that tip applies to men equally as women. Have a confident, no-nonsense posture while on the road. Take busy roads – it has hassles of traffic, being noisy but better than lonely stretches. Run in the opposite direction of the crowd… Always! You save yourself from lot of vehicles, unfriendly creatures. Only for the sake of safety (everytime I ran alone), I ditched the music many years back – it does interfere with your alertness big time. I also want my onlookers to have the perception that I am aware of my surroundings and they cannot mess with me. I am a dawn runner mostly – So never run alone at that hour. But that doesn’t always happen, so then I run later in the day. Chose crowded, main roads, with decent traffic and run against the traffic. Again no music. You need to be safe from vehicles. Running alone – now carry my phone on all my runs and have it properly charged. If a vehicle or a man crosses me more than once – I change my route immediately (sixth sense ladies, always!). I have also often confronted men by shouting at them when they pass remarks. Effective it has been to the extent – they have backed off. And that’s what I want.